National Secretary of the Felix Mutai-led MMD faction Raphael Nakachinda says President Edgar Lungu’s move to nominate him as a Member of Parliament was to destroy the MMD and the plan has since failed. Addressing MMD members on Saturday, February 9 at Moba Hotel in kitwe during the launch of his faction’s MMD Copperbelt Province card renewal, Nakachinda said enemies of his party where shocked to see him address MMD members. “The enemies of our Party the MMD are shocked that we have successfully organized the card renewal on the Copperbelt Province. I as Raphael Nakachinda would like to inform you that I am still MMD and I am still your National Secretary” Nakachinda said. Nakachinda than took a swipe at Republican President, Edgar Lungu that if he appointed him to destroy the MMD, then his plan had terribly failed. “When I was nominated as Member of Parliament, I told Edgar Lungu that if my Nomination was to destroy the MMD he would be in for a rude shock. Today is the beginning of that rude shock,” Nakachinda boasted. Nakachinda then told them that the MMD would win the 2021 Elections. “I would like to take this time to inform you all that we the MMD are winning the 2021 Presidential elections. Our President Hon. Felix Mutati is a sellable product and he will sell like hot pieces of cake in 2021,” Nakachinda told the cheering hired crowd. And faction MMD Vice President in charge of politics, Mutolo Phiri said people are suffering under the PF. “When we the MMD were in power, People had money in their pockets and we managed to keep the prices of essential commodities low. Now under the PF, people have no money in their pockets and the prices of commodities have skyrocketed,” Mr. Phiri said. 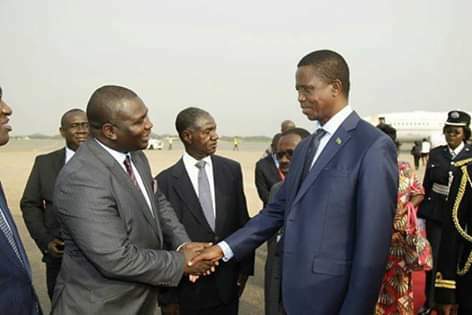 He further declared that in 2021, his team led by Mutati would take over governance of Zambia. Nakachinda is an interesting guy. It is a joke come 2021, MMD faction led by Mutati will go into bed with PF. If Nakachinda has any salt left, let him resign as MP. This is just politicking. Nakachinda had thanked the President for nominating him to Parliament.If what has been quoted above is true that the Presidential nomination of him was to weaken the MMD,then it is time ECL WITHDREW this kind gesture and reward some very royal PF followers.It is a shame that a good gesture from the President can be crudely abused.